Amphibole Phantom Quartz is also known as Angel Phantom Quartz because the inner “phantom” appears to resemble the wispy wings of an angel. A Phantom is a crystal or mineral deposit within a crystal. Phantoms are formed when the growth of a crystal has been interrupted and then begins to grow again. While the color of Phantoms will vary from crystal to crystal, depending upon the type of mineral of which they are made, Amphibole Phantoms often contain inclusions of (yellow) Limonite, (red) Hematite, (white) Kaolinite, or (pink) Lithium. Often, the original mineral gets washed away, leaving only the Quartz to grow afterwards. Angel Phantom Quartz is an excellent crystal to use with the Third Eye and Crown Chakras, as it enables you to gain a stronger connection to the Angelic realm as well as communication with your own Guardian Angel. This protective, high vibration stone increases our awareness of the spiritual realm, past-life recall and lucid dreaming. A bringer of intense love, beauty and joy, Angel Phantom Quartz is invaluable in the home, especially when you surround it with other Angelic crystals such as Seraphinite, Angelite and Celestite. It will enable you to see your best inner strengths and increase your self-empowerment. The addition of the Angel Phantom Quartz inclusions offer added benefits - the grounding of Hematite, the protection against psychic attack of Limonite, and the intuition-building of Kaolinite - combining to form a crystal that is a must in order to be a step closer to Universal love. Keep an Angel Phantom Quartz crystal in your pocket, in your home, or in the workplace to know that your angels are always nearby. Clear Quartz Phantoms are excellent for balancing and aligning all the Chakras to the Crown Chakra. Those who are interested in spiritual growth and connection with the higher realms may find Clear Quartz Phantoms particularly helpful since the White Phantoms inside work with the Crown Chakra to integrate the experiences of the higher self into the other Chakras. 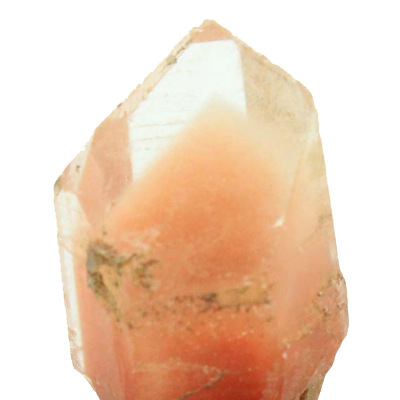 Click here to see Amphibole Angel Phantom Quartz in our online catalog. Affirmation: I am connected to spiritual realms. Question: Do you call upon angelic beings for assistance in your daily life?